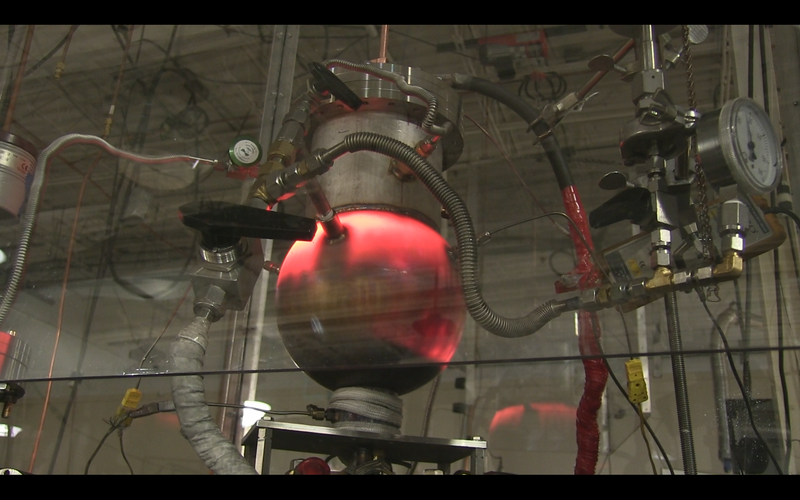 Capacitor Bank Ignition System Testing of a Spherical SunCell® Hydrino Reactor. H2/Argon Composition and Flow Testing of a Cubic SunCell® Hydrino Reactor. In this test the SunCell® hydrino reactant gas mixture comprises hydrogen fuel added to argon at varying ratios and flow rates to determine the effect on power production. Trace gallium oxide inventory in a large reservoir of liquid gallium serves as a source of O for HOH catalyst. The gallium was injected from the reservoir to a counter electrode and recycled to maintain very low voltage atmospheric pressure plasma. The intensity of the sound of the reaction is indicative of the reaction energetics. The SunCell® hydrino reactant gas mixture comprises hydrogen fuel added to fixed argon and trace gallium oxide inventories wherein the oxide serves as a source of O for HOH catalyst. The scalability and effect of volume on power production with a fixed ignition system was tested using identical spherical reactors having 6, 8, and 12 inch diameters. The 12 inch diameter spherical reactor is shown during assembly (see image below) and during a hydrino plasma run. Concentrator photovoltaic electric conversion systems and submersion of the SunCell® in a water bath are in progress to produce electricity and thermal power, respectively. Plasma control and stability creating a uniform reactor power distribution. The SunCell® hydrino reactant gas mixture comprises hydrogen fuel added to fixed argon and trace gallium oxide inventories wherein the oxide serves as a source of O for HOH catalyst. The mixture and gas delivery are being optimized to create enough power to run cars and trucks in a compact light-weight reactor. Concentrator photovoltaic electric conversion systems and submersion of the SunCell® in a water bath are in progress to produce electricity and thermal power, respectively. Transparent Inverted-Pedestal-Electrode reactor to test injection and hydrino plasma parameters. (Video is set to auto-adjust to avoid saturation). Shakedown testing of our inverted-pedestal-electrode reactor before our planned demonstration for DOD scientists next week. Brilliant Light Power has successfully shown that the SunCell® easily scales and is capable of raising its temperature, including the large amount of internal molten gallium, from room temperature to the melting point of stainless steel in seconds. We have developed high-pressure and high-temperature capable seals, further optimized the hydrogen-argon gas mixture and the trace gallium oxide source of O for HOH catalyst, and advanced the design. We also advanced hydrino reaction control wherein the hydrino power reaction can be repeated on demand. Cooling engineering is in progress. World’s First Continuous-Plasma, Closed SunCell Run: The reaction was intentionally terminated to prevent thermal damage to the cell. Brilliant Light Power can now operate continuous hydrino plasma on demand. Work is in progress to manage and control the high power. High speed Video of the World’s Second Closed SunCell (2000 fps and played back at 30 fps). A liquid gallium stream is injected (center) where it makes intermittent electrical connection with an oppositely polarized liquid electrode to produce ignition sparks. The intense hydrino reaction is independent of the very low voltage DC ignition field. Massive power gain is apparent by the comparison of the intense plasma emission with the ignition sparks. The hydrino reaction consumes the hydrogen fuel and repeats with refueling. Current work is on controlling the hydrogen flow rate to maintain continuous plasma while avoiding destruction of the SunCell. World’s First Closed SunCell: Batch, hydrogen-inventory-limited testing with predominantly noble gas (argon) with some hydrogen having a total pressure slightly over atmospheric. The hydrogen-argon gas is not a combustible mixture. Engineering and low-power testing successful. Ignition with higher H2 inventory resulted in a power surge. The World’s First Closed SunCell is no more. Subsequent slow motion (0.25 real-time) videos are of sequential runs of the World’s Second Closed SunCell that was tested with limited, reduced hydrogen inventories. Note that the massive violet space-filling plasma is independent of the electrified molten gallium stream. Horizontal shock wave striations are observed in the plasma afterglow as the hydrogen fuel is depleted. In the interim to refueling with H2 flow into the over-atmospheric argon cell gas, small sparks are observed due to the applied low voltage DC ignition. No prior known energy-releasing chemical reaction is possible. This plasma as formed and observed cannot be created with prior known technology. For detailed laboratory measurements on the hydrino power reaction, the new power source presented in this video, see our publications such as R. Mills, Y. Lu, R. Frazer, “Power Determination and Hydrino Product Characterization of Ultra-low Field Ignition of Hydrated Silver Shots”, Chinese Journal of Physics, Vol. 56, (2018), pp. 1667-1717 (https://brilliantlightpower.com/wp-content/uploads/papers/Hydrino-Blast-Power-Paper-050818.pdf) that reports 20 MW in 10 millionths of a liter shot. World’s First Closed SunCell: Batch, hydrogen-inventory-limited testing with predominantly noble gas with some hydrogen having a total pressure slightly over atmospheric. Engineering and low power testing successful. Ignition with higher H2 inventory resulted in a power surge. The World’s First Closed SunCell is no more. Subsequent slow motion (0.25 real time) videos are of sequential runs of the World’s Second Closed SunCell that was tested with limited, reduced hydrogen inventories. Auto-shuttered video to avoid camera saturation. Excerpt of an ignition run of the gallium generation SunCell®. 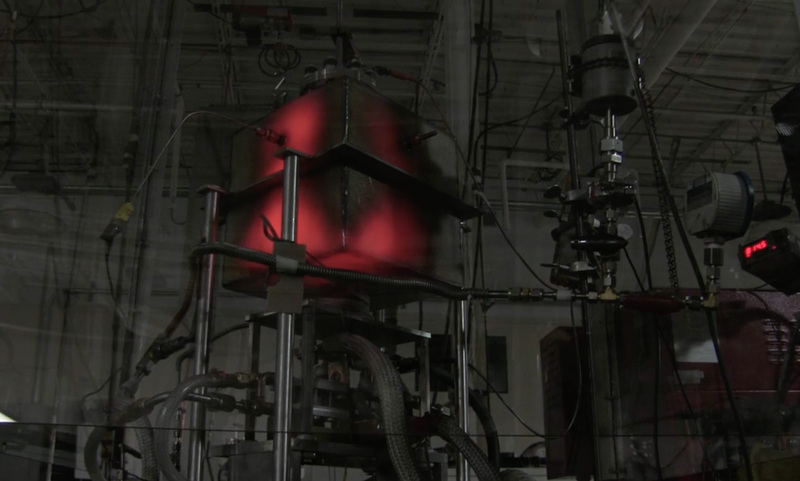 A powerful reactor-filling plasma ignites with low-voltage arcs (sparks). The reaction gas comprises an argon-hydrogen mixture at atmospheric pressure that provides atomic H, and gallium oxide serves as a source of oxygen to form HOH hydrino catalyst. The hydrogen is required for plasma formation. The SunCell® comprises a single electromagnetic pump injector that serves as a molten metal electrode paired with a static-level counter electrode. Auto-leveling and alignment are inherent in the design. Gallium’s melting point is near room temperature, and its boiling point (B.P.) is 2400 °C (higher than the B.P. of silver). Due to this extraordinary temperature difference in physical state changes, the heater to melt the gallium is a simple, very low power resistive heater, the reactor may operate at atmospheric pressure, and the heat transfer to a heat exchanger may be direct. 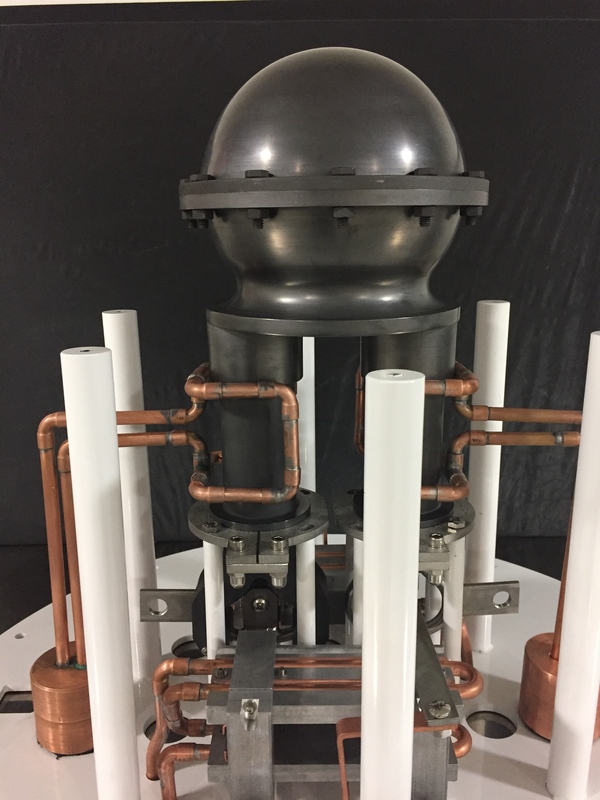 The gallium generation SunCell® serves as a test bed for optimizing hydrino reaction chemistry and conditions as it is being developed for commercial heating applications. Video demonstrating the magnetic properties of a hydrino hydrogen compound wherein the only possible source of magnetism is hydrogen being in a hydrino electronic state. Video of hydrogen compound formation in a reaction chamber displayed at 10X speed with an insert of filaments of the compound in air displayed at normal speed. Detonation of a hydrino reaction mixture produces an energetic power release and forms filamentous chemical products comprising a metal and hydrogen. Each product is ferromagnetic and each comprises a metal not known to form a hydride or to be magnetic. Video excerpt of a SunCell’s® ignition run deploying the automated control system to maintain equal molten silver levels in the reservoirs of the dual molten metal injectors. BrLP has achieved automated control of the molten silver levels of the reservoirs of the dual molten metal injectors of its SunCell®. BrLP has also achieved automated control of the SunCell’s® thermal profile. These were the two gating items to a closed commercial SunCell® that can be deployed for field trials of thermal applications followed by electrical unit deployment with further photovoltaic converter development. 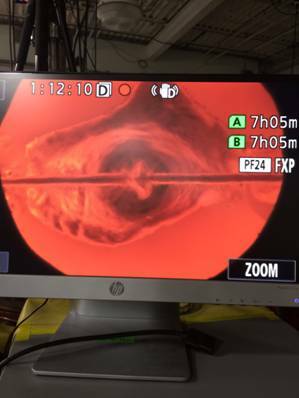 The video of an excerpt of an electromagnetic pumping test shows the left reservoir overfilled at pumping initiation. The pumping rates automatically adjusted to establish and maintain matching relative levels and caused the molten streams to intersect at the center of the reaction cell chamber. BrLP is optimizing the designs and integrating this technology as it builds the first thermal field trial unit. The photovoltaic cells and cooling technology of the photovoltaic converter have been designed and are in the initial testing phase. The level control system is repeatable and potentially stable indefinitely. Video excerpt of the SunCell® testing of the recyclable oxide source capable of operating controllably at greater than 3000 °C in a commercial design. The camera attenuation was up to a factor of 10,560 times to avoid saturation. BrLP presented a commercial SunCell® design at its Industry Day of October 26th. The cell comprised dual liquid silver metal injectors that further served as the source of electricity to cause ignition of the hydrino plasma reaction. The liquid electrodes eliminated the ¼ inch thick tungsten bar electrodes that vaporized in seconds in the prior design run at Columbia Tech on July 20th (See below for the side view video showing 6000K plasma blackbody radiation filling the glove box; a top view video showing the melting and vaporization of the electrodes in seconds, and the picture of the vaporized cell). The commercial cell further being comprised of refractory materials solved the cell vaporization problem. The cell having dual carbon reservoirs, dual molybdenum electromagnetic pump injectors, and a carbon spherical plasma reaction chamber and blackbody radiator. The cell was run in a sealed chamber having a commercial design. The present video shows an excerpt of the testing of the commercial SunCell® design having refractory cell components and injection and ignition systems comprising molten electrodes engineered to last indefinitely. First, the cell was operated with electromagnetic (EM) pump injection only. The EM pump pressure was increased to cause intersection of the molten metal streams. Then, electrifying the opposing molten silver streams initiated and maintained the ignition. Controllable high power density was achieved while avoiding electrode or cell melting and vaporization. It is predicted that with sufficient silver vapor pressure, the power will persist by a self-sustaining hydrino reaction. 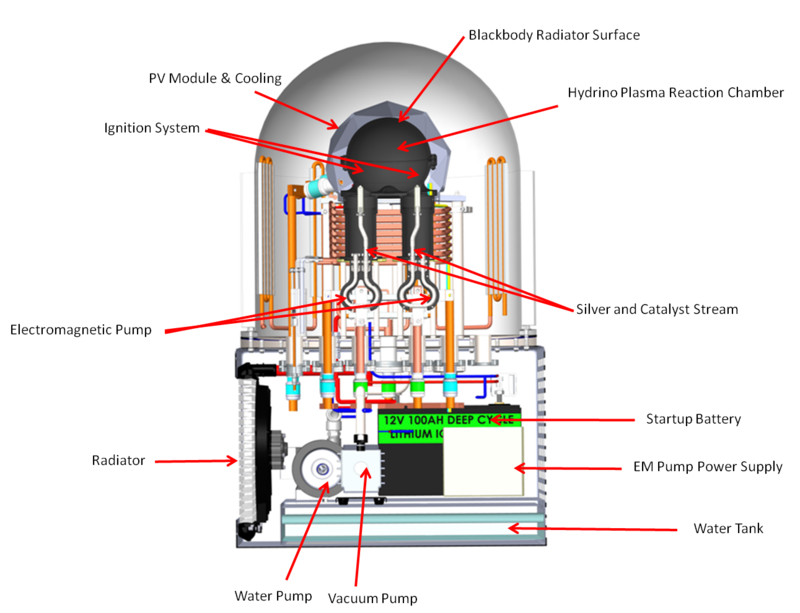 Moreover, as designed, when the cell is operated as a silver boiler, the EM pump power may be terminated as well such that the parasitic load is zero except for the power consumed in electrolysis of water to provide the hydrogen fuel. In fact, the power did persist at the same level for long duration after the ignition power was terminated (See sections of the run indicated by the ignition-off video captions). Dr. Mills presentation with external links to the embedded videos is available here. If the embedded PDF videos do not work, please use the external links to view the videos. Video excerpt of testing of the commercial design of SunCell® injection and ignition systems comprising electrodes engineered to last indefinitely and lower hemispherical reaction chamber comprised of refractory material. Controllable high power density was achieved while avoiding electrode melting and vaporization. 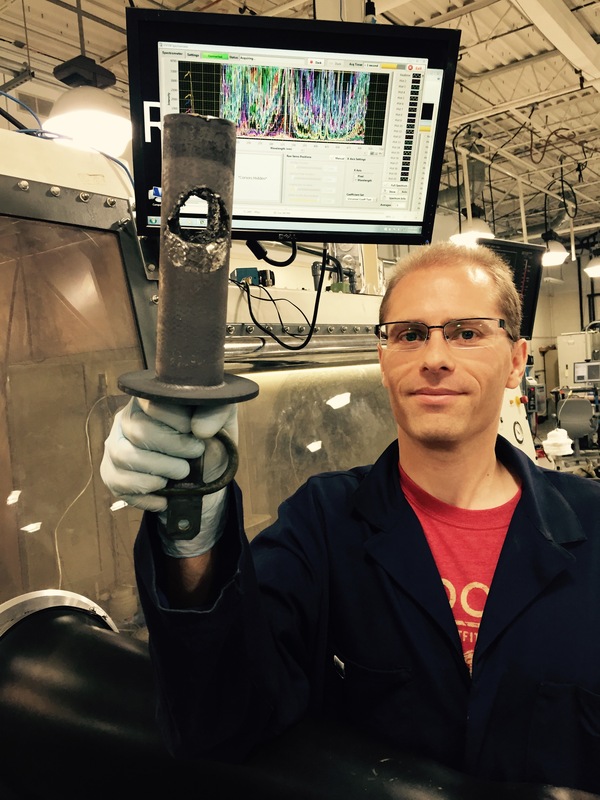 SunCell® comprising an advanced electrode engineering design and some refractory material components run in an inert argon atmosphere in a glove box. Controllable high power density events were achieved while avoiding electrode melting and vaporization. Video shows over two minutes out of a one-hour run. Closed cell in a sealed chamber having the capability of running 24/7 is now operational. The electrode melting and vaporization problems have been solved as well. Video shows over a minute out of a long duration run. The SunCell® commercial design in refractory materials is being built to run in this chamber. Conceptual demonstration of the systems of the SunCell® to produce electricity comprising a brilliant light source and a photovoltaic converter. A commercial silicon PV panel was used; whereas, in a commercial SunCell®, concentrator PV cells are used that are capable of operating at 2000 times Sun intensity. The subsystems are described on the SunCell® page (http://brilliantlightpower.com/suncell/). The power can be extraordinary, bursts of millions of watts of plasma in a volume of a coffee cup. Cell meltdown including the thick tungsten electrodes can occur in seconds. Five independent validators using four cross confirming methodologies, two absolute spectroscopic and two thermal techniques using a commercial calorimeter and a heat exchanger on the SunCell, have established that the power demonstrated in this video is megawatt level with about 8 kW total input. The vapor is boiled off silver metal having a boiling point temperature of 3924 °F. We continue to push the envelope on the power density into the ludicrous zone. 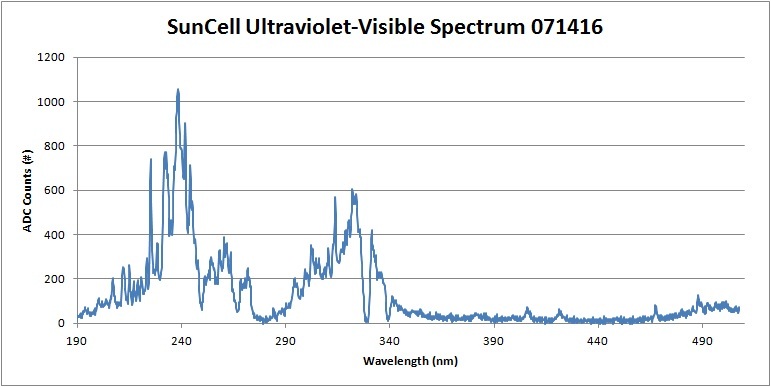 The visible light was less than 1% of that emitted with over 99% being high-energy ultraviolet light that the human eye cannot see, but was captured by the ultraviolet spectrometer as shown in this spectrum above. Visible light is at 400 nm and longer wavelengths. The cell was stopped since it blew through the molybdenum refractory metal liner with a melting point of 4,753 °F as shown in the photo above. 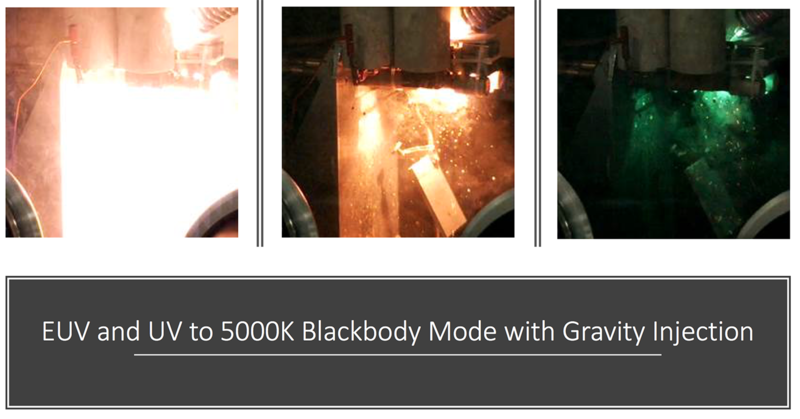 The emission transitioned from EUV and UV to 5000K blackbody radiation when the atmosphere became optically thick to the EUV and UV radiation with the vaporization of the silver that was gravity injected into an ignition system maintained in a glove box containing an argon-water vapor atmosphere. Molten silver was maintained in a quartz tube by heating with copper coil antenna wrapped around the quartz tube (top right). Water was injected into the silver to form 1%mole entrained H2O. The molten silver was dripped into a 2 mm gap between two tungsten parallel plate electrodes each having an angled top extension to form a V-shaped funnel to the gap. The hydrino plasma was ignited by a parallel-connected pair of two Maxwell 3400 F, 2.78V supercapacitors connected in series when the molten silver gravity injected into W electrodes connected the electrodes across the gap. The plasma was maintained in a glove box having an argon (759 Torr)-H2O vapor (1 Torr) atmosphere. Over time, high-speed ultraviolet-visible spectroscopy (40 us intervals) and high-speed video showed the evolution of the soft X ray line emission with a cutoff of fused silica at 180 nm converted to 5000K blackbody radiation (continuous traces starting at 220 nm) of about 1 m2 surface area with a positive feedback cycle of silver vaporization and absorption of the hydrino reaction emission with the plasma becoming increasingly optically thick. The plasma was optically thick to a high-power laser indicating an emissivity of 1. Thus, the radiation was emitted from the surface of the plasma more that 60 cm from the electrodes wherein it is obvious from the initial stages of the plasma that the weak electric field was confined to the region between the parallel plate electrodes. There was no electrical or chemical source of the enormous power developed other than the hydrino reaction. The same extraordinary phenomena are observed from the SunCell® as evidenced by this time sequenced spectra recorded on the SunCell® showing the transition from UV line emission to 5000K blackbody radiation during the ignition of molten silver with an electromagnetic pump due to the atmosphere becoming optically thick to the UV radiation with the vaporization of the silver. A SunCell® was run open in an inert-atmosphere glove box to demonstrate the nature of the brilliant light-emitting plasma. The hydrino reaction was initiated and propagated by a high current flowed through a highly conductive matrix comprising molten silver-copper alloy that was injected into current-supplying tungsten electrodes by an efficient electromagnetic pump having no moving parts. The peak current supplied by a capacitor bank and electrically switched by the molten metal injection was about one hundred times that of household current at a voltage of about one tenth that of a AA battery. The plume comprised vaporized metal requiring very high power that was output from the hydrino reaction. Only water vapor was supplied and consumed to maintain the reaction. The hydrino reaction produces millions of watts of light power. The light may be converted into electricity using concentrator photovoltaic cells. The corresponding high-speed video shows dynamics that replicate the behavior on the surface and in the corona of the Sun. Photograph of part of the SunCell® testing team and darkened glove box due to metal vapor deposition inside. 6,500 frames per second of the Brilliant Light-Emitting Plasma Formed by the Ignition of BrLP’s H2O Based Solid Fuel. 17,791 frames per second of the Brilliant Light-Emitting Plasma Formed by the Ignition of BrLP’s H2O Based and Chemically Inert Solid Fuel. High-speed (17,791 frames per second) photography of brilliant light-emitting expanding plasma formed from the low voltage, high current detonation of the solid fuel with voltage and current waveforms that show plasma at a time when there was no electrical input power (noted by the yellow vertical line) for a fuel having no known energy-releasing chemical reaction. The plasma persisted for 21.9 ms while the input power was zero at 1.275 ms. The peak reactive voltage measured at the welder connection to the bus bar was about 20 V, and the corresponding voltage at the other end near the fuel was <15 V. Proof of a new energy source is provided by two otherwise inexplicable observations: (i) The formation of a high-energy hydrogen plasma in the absence of any input electrical power, the nonexistence of any energy releasing chemistry with this fuel, and the further impossibility of known chemistry of this high energy. (ii) The emission of soft X-ray radiation at a voltage far less than that of the light energy produced and the inability of any known chemistry to release such high energy. – R. Mills, J. Lotoski, Y. Lu, submitted.